With over six pages of scale drawings by Colin Owers, this unique monograph from the late Jack Bruce details the curious French Spad S.A-2 and S.A.-4 pulpit fighters with the gunner's cockpit ahead of the engine and airscrew! The highly informative narrative is complemented by over 20 rare photos and topped off by colours and markings notes that feature rear cover colour profiles by Ray Rimell. One of the most popular titles in the MDF series. 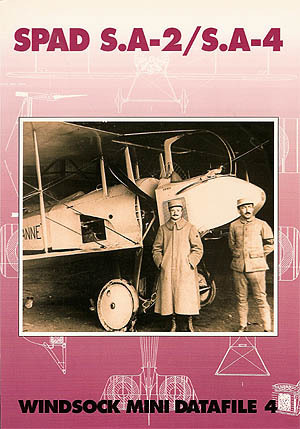 Special Gotha features - cover plates and Roden kit review * Spad A2 and Eduard Pfalz D.IIIa photo-builds * Curtiss H.16 photo feature * Roland D.IV 1:48/1:72 plans * Italian SIA biplanes.